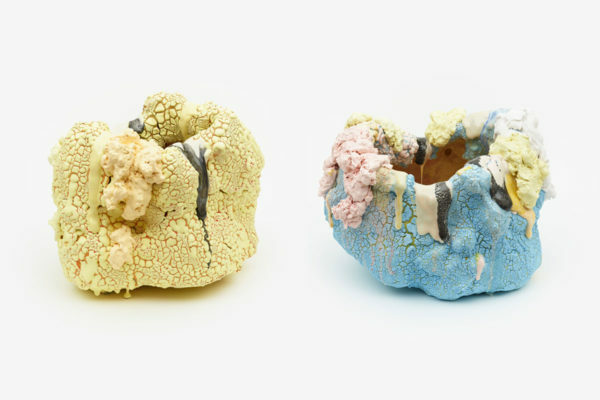 From left to right: Brian Rochefort, Tulipe, 2018, Ceramic, glaze, glass fragments, Approx. 19 x 18 x 17 in., Courtesy the Artist. Brian Rochefort, Asteroid, 2018, Ceramic, glaze, glass fragments, Approx. 19 x 16 x 13 in., Courtesy the Artist. Museum of Contemporary Art Santa Barbara (MCASB) is pleased to announce the first institutional solo-exhibition of Los Angeles, California-based artist Brian Rochefort. As part of MCASB’s Bloom Projects series Rochefort will exhibit new works as an extension of ongoing body of work Craters. Building ceramic vessels reminiscent of geological formations in Belize, Tanzania, Nicaragua, and the Galapagos Islands, Rochefort has developed the Craters series over the last three years in response to his extensive travels to remote locations throughout South and Central America, and East Africa. What began as a fascination with volcanoes and craters, such as Sierra Negra Crater in Ecuador, live volcanoes in Nicaragua, and Ngorongoro Crater in Tanzania, has shifted to interests in protected barrier reefs and tropical cloud forests, amongst other physical phenomena. This exhibition is curated by Alexandra Terry, Associate Curator. Brian Rochefort (b. 1985, Rhode Island, USA) lives and works in Los Angeles, USA. Rochefort holds a BFA from Rhode Island School of Design (2007) and was a 2018 Visiting Artist Lecturer at the University of Iowa. He has completed residencies at The Mistake Room, Guadalajara, Mexico (2018) and the Lillian Fellowship Residency at the Archie Bray Foundation, Montana, USA (2009). Rochefort’s work has been featured in solo shows at Van Doren Waxter, New York, USA (2017, 2019), and group shows including Sorry We're Closed, Brussels, Belgium (2018); Boca Raton Museum of Art, Florida, USA (2017); Everson Museum of Art, Syracuse, USA (2017); Steve Turner Gallery, Los Angeles, USA (2017); The Cabin, Los Angeles, USA (2015); and Retrospective Gallery, Hudson, USA (2015). Forthcoming solo shows include Caterina Tognon, in collaboration with Van Doren Waxter, Venice, Italy (2019), and Massimo DiCarlo, London, UK (2019).